You know the saying about trusting your gut? There is a good reason we refer to our stomach for advice. The gut contains 70% of our immune system strength. Without proper digestion, our gut can wreak serious havoc on the health of our entire body. The lining of your gut is home to more neurons than in the spinal cord, so much that scientists refer to our stomach as our second brain. Serotonin, which regulates our happiness and mood, is actually produced in the lining of our stomach. Low levels of this hormone are known symptoms for depression and other serious mental illness. Although there are natural enzymes present in both our saliva and in the acids of our digestive tract, the foods we eat play an extremely important role in either encouraging or discouraging proper digestion and absorption of nutrients. These colourful root vegetables are not only very tasty, but they contain high amounts of fiber and starch making them extremely easy to digest. 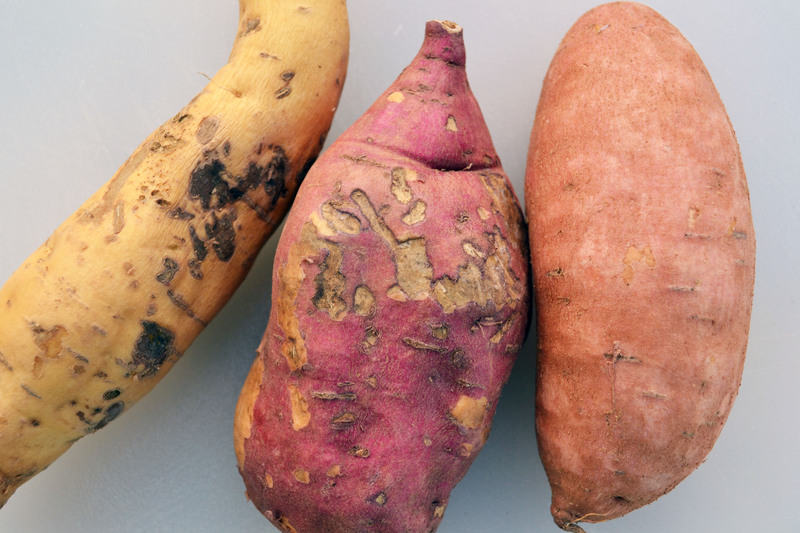 Studies have shown that the B-complex vitamin content in sweet potatoes can actually help prevent stomach ulcers. Soothing to both the intestines and stomach, these veggies reduce excess acidity and have anti-inflammatory properties, keeping the gut balanced and better suited to absorb nutrients. Beetroots are known for their vibrant color, both before and after digestion. Eating beets can often tint both stool and urine, but they are among the best foods to calm indigestion and prevent constipation. Ginger is known as a warming spice and can help stoke the fire in your digestive tract. It stimulates saliva, gastric enzymes, and bile to increase digestive productivity. Also used for centuries as a medicinal anti-bacterial, ginger has the power to kill bad bacteria that threatens the balance gut flora necessary for proper breakdown of foods. The insoluble fiber in the skin of just one apple can substantially alleviate the pain and discomfort of constipation. An apple a day will keep constipation away! Sure, constipation is bad for digestive health, but the alternative can be just as harmful to the body. Diarrhea can deplete the body of essential digestive electrolytes and potassium, and bananas are a great preventative food. Proteins in bananas help to stabilize weak and overactive nerves in the digestive tract. Have you ever wondered where the tradition of the post dinner mint came from? Well here is your answer. Peppermint has long been used as a digestive aid. This popular aromatic herb is both anti-inflammatory and antiseptic, which packs a powerful punch in calming a distressed or overworked digestive tract. Its cooling taste is also a soothing antidote to an overheated stomach, which is often a precursor for painful acid reflux. Whether you’re eating these foods or not, it is always important to eat slowly and properly chew your meal as your mouth is the first step in the system of proper digestion. One or many of these ingredients blend well into smoothies or are great when added to a hot tea post meal.